Today the temperature in Austin stayed in the cool fifties. By way of contrast, it was 90 when I was sipping cocktails al fresco on Friday, and today most Austinites realized that we can’t remember where we last saw our sweaters seven months ago. Once I found a fleece that I have not had a chance to wear since we left the Andes, I remembered that what I also really needed to brave the unseasonably cold weather (or normal if you live almost anywhere else) was a hearty soup and freshly baked cornbread. We made a nice barley and kale soup, but it was the cornbread that stole the show. Hard winter squashes are actually grown in the summer, but most varieties can be stored and consumed throughout the colder months. Johnson’s Backyard Garden has been selling several types of winter squash this year and like the overgrown squirrels that we are, James and I have been hoarding them for the last few months. Roasted squash makes a great addition to many baked goods since it is nutrient dense, cuts down on the amount of fat that is needed to make a rich creamy dough, and it tastes wonderful. 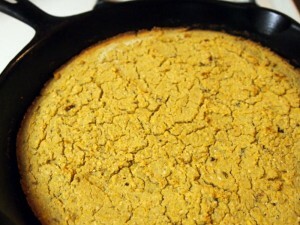 I also used some wonderful coarse ground Hickory King cornmeal that we received from Richardson Farms. To balance the sweetness of the squash and corn I added some diced jalapenos (aka chipotles) that we smoked earlier this summer and some fresh ground cumin. This dynamite Winter Squash Cornbread would go amazingly well with our Pureed Kale Soup, Italian White Bean and Kale Soup, Tomatillo Chili, and many more soups to come!